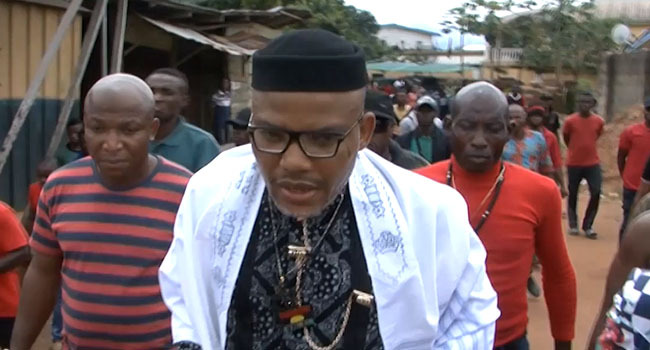 The Federal High Court in Abuja has approved the application by the Federal Government, seeking the proscription of the Indigenous People of Biafra. Acting Chief Judge of the Federal High Court, Justice Abdu Kafarati, granted the order on Wednesday, five days after the military released a statement declaring IPOB a terrorist group and South-East governors proscribed its activities. The Attorney-General of the Federation and Minister of Justice, Mr Abubakar Malami (SAN), had filed an ex-parte motion filed motion asking the court to proscribe the activities of the group and declare it a terrorist organisation. Mr Malami cited Section 2 of the Terrorism ‎Prevention Act and listed IPOB as the only respondent in the suit which was marked FHC/ABJ/CS/871/2017. The matter was not heard in the open court but in the chambers of the acting Chief Judge of the Federal High Court. Justice Kafarati, after listening to the application, granted the applicant’s prayer and consequently ordered the proscription of the group. He ordered that the activities of IPOB in any part of Nigeria, especially in the South East and South South regions, amount to acts of terrorism and illegality. Earlier on Wednesday, the Minister of Information and Culture, Mr Lai Mohammed, had hinted about the application when he told journalists that President Muhammadu Buhari had approved the proscription of IPOB. “Before the President left, he did approve the proscription but the process is on,” the Minister told State House correspondents after the weekly Federal Executive Council meeting inside the Presidential Villa in Abuja.